In 12-inch skillet, heat oil over medium heat. Cook beef in oil until brown on all sides. In 4- to 6-quart slow cooker, place potatoes, carrots and onions. Place beef on vegetables. In small bowl, mix horseradish, salt, pepper and 1 cup water; pour over beef. Remove beef and vegetables from cooker; place on serving platter. Cover to keep warm. Into 2-cup measuring cup, pour juices from cooker; skim excess fat from juices. Add enough water to juices to measure 2 cups; pour into 2-quart saucepan. In tightly covered container, shake 1/2 cup cold water and the flour; gradually stir into juices. Heat to boiling, stirring constantly. Boil and stir 1 minute. 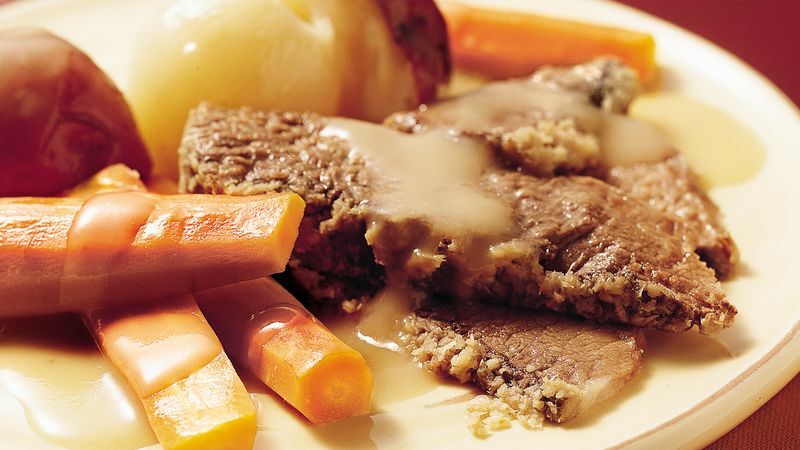 Serve gravy with beef and vegetables. Carrots can vary in size and thickness. For even cooking, if the stem ends of the carrots are very thick, cut in half lengthwise. Be sure you use prepared horseradish, not horseradish sauce. There is a big difference in flavor impact.